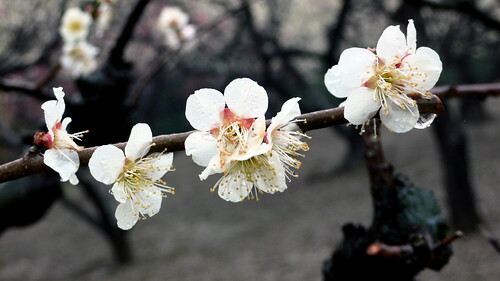 It’s almost time for the cherry blossoms in Osaka (apparently they’re already out in droves in Tokyo), but plum blossoms come first, while it’s still the cold of winter. 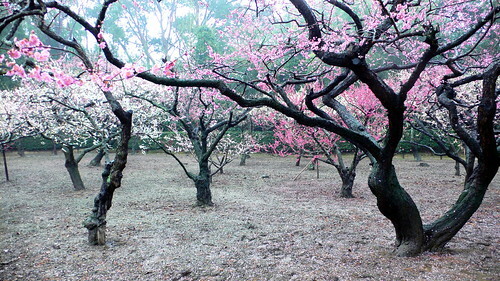 Our last stop at Korakuen was the Plum Grove, which was in full blossom, a snowfall field of white, pink, and purple standing out from the dead grass and the stark black shapes of the empty trees. 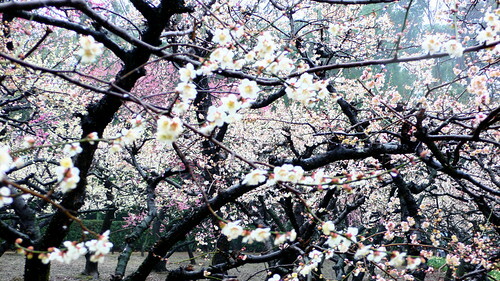 There are about 100 plum trees in Korakuen and each seemed to have its own special shape and blossom pattern. Inexplicably, the signpost at the main gate pointing to the Plum Grove simply said, “Plum Baby.” It was hard to know what to expect.